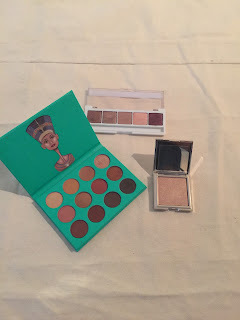 Welcome to a new featured post called, "Palette & a Partner". Like the self-serving person I am, this post is not necessarily for my audience, but to instead help me utilize the ridiculous amount of makeup that I have, which is not being used. I have palettes, highlighters, lip products, and blushes that are just gathering dust, so in an order to maximize usage and honestly, just an effort to enjoy what I have purchased I have created this tag. Each week, I will pick one "main" palette and another product (smaller palette, blush, highlighter, eye product or lip product) and use them for the entire week. This will challenge me to minimize my spending and maximize my usage by requiring me to faithful post each week about the beauty products chosen and to be creative and have fun! This week, I have decided to start off with a bang! 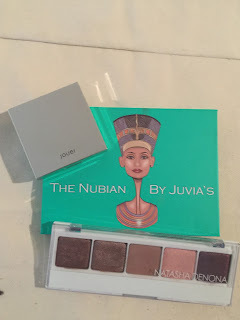 I selected Juvia's Place "Nubian Palette," Jouer's Powder Highlighter in "Topaz," and Natasha Denona's "Palette 5, #02". See below for the stunning combo!